Good morning, card makers, and welcome back! Today I've got another Halloween tag featuring Rare Oddities and An Eerie Tale products from Graphic 45. Cut patterned papers, edge sides with black marker and ink edges. 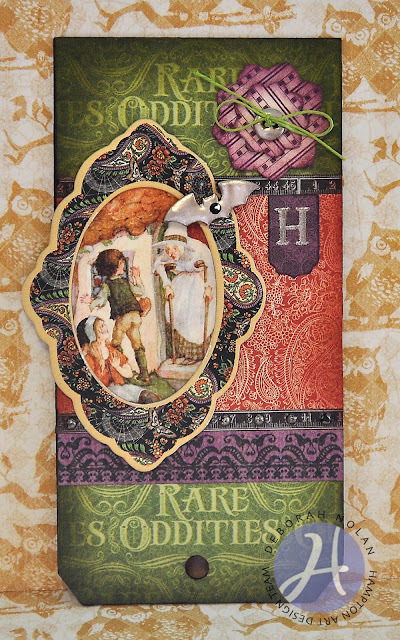 Adhere patterned papers (order: green "rare oddities", red paisley, black ruler, purple scrollwork). Re-punch hole and edge with ink. Re-swipe sides and edge hole with black ink. Cut picture, adhere to back of chipboard frame, and adhere frame to tag. Die cut flowers, ink edges and adhere. Cover bat veneer, button, and pearls with embossing powder, apply powder, and heat; adhere. Punch ting tag, stamp "H", apply embossing powder, heat and adhere. Adhere sticker to note flap.